A group of adventurers searching for a cure for comatose children find themselves trapped in a sequence of virtual worlds, the only opponents of a conspiracy of the rich to live forever in a dream. Now, they are forced to make an uneasy alliance with their only surviving former enemy against his treacherous sidekick Johnny Wulgaru, a serial killer with a chance to play God forever. 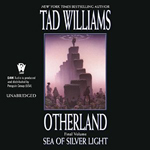 Few science fiction sagas have achieved the level of critical acclaim-and best-selling popularity-as Tad Williams’s Otherland novels. A brilliant blend of science fiction, fantasy, and techno thriller, it is a rich, multilayered epic of future possibilities. The finale to the Otherland series, Sea of Silver Light wraps up the multitude of story lines that began in City of Golden Shadow. While the book dragged in places, and some may find that the book (and the series, especially in the middle books) wanders a bit too much, it is hard not to appreciate Tad Williams’ amazingly prescient series, especially if you’re a fan of a) the internet and b) classic literature. It’s probably safe to say that the wandering will not be for everybody, but for those that enjoy the mystery and the references to other works, the series could be a lot of fun. A series written in the mid-late 90’s, the books cover amazing breadth of topics with a wide cast of characters in this world and in a parallel online world. What started as a cyberpunk story quickly unfolded into a much larger world with many players with significantly different motivations–on all sides of the story. With unlikely/atypical heroes (a South African woman, an African “bushman”, a blind woman, two teenagers, a mom, and a guy who doesn’t know his own past, not to mention a 5 or 6-year old girl, an ancient man…the cast is huge!) and a sprawling world, it’s easy to see why some people are overwhelmed. The more intriguing part, though, is trying to piece together the entire story, trying to figure out who’s involved in the world and for what purpose…and what the online world really is. I will admit that when the world was pieced together, it seemed pretty out there…but I was so engrossed that I didn’t really mind. The only part I really did mind was the end; the book felt maybe a little too neat, and a little too drawn out at the end. That said, it does leave an opening for Williams to return to the world (and looking on Goodreads, it seems as if he may have done just that with a short story in Legends II. It’s hard to describe the book and what happened in the series without venturing into spoiler territory. Basically, Renie, a young South African woman who is a sort of professor or teacher of computer engineering-type classes at a local university, finds one day that her brother is in a coma of sorts, a result of playing an online game. Games in the future world that Williams created are played online in a virtual reality simulation type schema, where users have different levels of gear that immerse them (fully or to varying degrees) into a virtual world. Some users go so far as to get neural cannulas, so that they can “jack in” and have the VR system provide a direct link to their brain, become fully immersed. Renie, wanting to try to find out more about how her brother came to be in the coma, went online to try to learn what she could of what he got into. Unsurprisingly, she found herself sucked into and literally stuck in a virtual world, unable to disconnect (sort of like Sword Art Online). While there, she meets others who have family members with the same affliction as her brother, and still others who have been recruited by an unknown agent to help Renie and those who are trying to help their children/family members. In parallel, there is the story of the Grail Brotherhood, a private group of the world’s most powerful and wealthiest elite, who wish to achieve immortality, and invest heavily in a system to do so. In a third story line, there is additional intrigue about a psychopath who calls himself “Dread” and seems to seek out ways to torture and kill others, online and in reality. His story ends up weaving and in some ways connecting the Grail Brotherhood and those of the people trying to help the children. Throughout, there are a multitude of worlds created by various users of the online system, many with literary references (such as The Wonderful Wizard of Oz and The War of the Worlds) or other evolving schema (such as a virtual rainforest that actually begins to evolve in the simulation world, similar to how it might have on earth). Williams uses cyberpunk, the idea of virtual/simulation worlds, and some more fantastical elements (some characters have special abilities, particularly abnormal/special mental powers) to weave a tale that leaves the reader picking up puzzle pieces and slowly piecing things together, just as the heroes do in the story. I’m most amazed at how prescient Williams was. The book was written in the mid-90’s, yet there are references to things in the world today, innovations that were barest ideas of science fiction in the 90’s. The first and most obvious observation is that the VR world, while more immersive than anything we really have today, is very much akin to the internet of today, with people spending entire lives and making entire livelihoods on the internet. People use tablet-like devices to connect to the networks, to make calls, to shop, to go into their simulation worlds–much like an iPad or other tablet of today. People watch movies on the internet, so-called “Net Flicks” (I really wonder if that’s how Netflix’s name came to be), and an automated robotic floor-sweeping robot (Roomba, anyone) makes an appearance or two. Kids have “storybook sunglasses” which sound a bit like more immersive (and frankly more fun) versions of Google Glass. Just today, I read an article on Slashdot about body hacking through the vagal nerve, a topic that’s actually brought up in the book (as a therapy that is abused, oddly enough). There are other examples, which reading in 2015, are fun nuggets to pick up along the way. It’s crazy how forward-thinking this book was, how much it got “right” even for 2015 (I think the book is supposed to take place closer to 2050). I liked this book and really enjoyed the series. 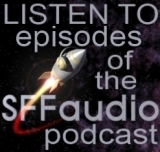 I think that listening was a fantastic way to experience the book, to be able to lay back and shut my eyes and become immersed in the book as the characters are immersed in their world. The narration was (as I’ve said in my other reviews) great, if a little slow. But that meant that I could speed the book up slightly in the playback, cutting down some of the listening time. The book (and series) may not be for everyone. I think it’s fair to criticize this book for going on a little “too long” or for being a little “too neat,” and it’s equally fair to think that Book 1 started slow or that books 2 and 3 wandered a bit (they absolutely were “middle books” in a series, which not everybody enjoys). But I still really liked the series. I look forward to reading it again in the future, maybe in a few years, to see how much I can pick up in advance, knowing as I do now, how the book ends.